You know those instructional inserts that come in just about everything you buy? If you’re lucky they’re a one-pager, showing a simple illustration of how your purchase works. But sometimes they’re multiple pages long, even approaching the length of a short story. This is often the case when the item in question is complex and contains many parts. If you’re like some people you try to avoid reading these instructions, preferring to forge ahead to the assembly/usage stage as quickly as possible, and you’ve probably had your fair share of times that this approach didn’t pan out. You were forced to re-do things and crack open the instruction manual anyway. If the instructions were written clearly, you may have eventually come to regard them as indispensable. 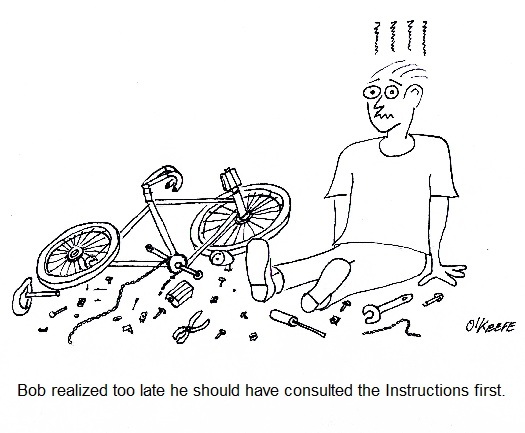 Clearly written instructions are one of the desired end results of the Development stage of the systems engineering approach to medical device design that we’ve been discussing. These instructions flow naturally from the finalized detailed design which has been produced earlier in this stage. Instructions aid consumers in the assembly, usage, and maintenance of the device, making for a satisfied customer. Instructions also aid in the efficient and proper manufacture of devices. Without them assembly personnel wouldn’t work as efficiently, and the end result might not be a desirable one. It’s easy for parts to end up where they don’t belong, adjustments to be off, etc. Just think about the last “assemble it yourself at home” project you were involved in. The desired result is for instructions produced to be well defined and capable of instructing line assembly personnel in the actual construction of the medical device that takes place during the Production stage. Subjects such as parts identification, assembly procedures, and layout of assembly lines are discussed, all of which are needed to plan out the manufacturing process effectively. The objective is to manufacture the devices in a cost effective manner and with minimum probability of defects. Next week we’ll continue our discussion on instructions, focusing on those that are produced during the Development stage that serve the purpose of guiding quality control technicians during the Production stage. Last time we opened our discussion on the Development stage of the systems engineering approach to medical device design and discovered that the best design concept is the one that meets all stakeholder requirements. Let’s use the flow chart shown in Figure 1 to illustrate what comes next in this stage. To begin the transformation from concept to completed design, engineers review documentation created during the Concept stage, including design notes, concept sketches, and of course the final requirements specification which has been approved by all stakeholders. Once the review is completed, it serves as a guide to the creation of detailed design documentation, including mechanical drawings, electrical schematics, and wiring diagrams. A bill of materials, or BOM, is also created, listing all parts needed to produce the final product. Each part designated within the BOM is associated with a specific manufacturer or supplying vendor, and each has been qualified with regard to price, availability, functionality, and quality. The design documentation and BOM are also subject to a review by a fresh set of eyes, engineers who have no involvement in the project. If they should discover a problem, the design is rejected and sent back to the design engineers for revision. This process of evaluation and correction are repeated until the design successfully passes a final review. Only then can the fully approved finished design move on to the production stage. Next time we’ll continue our discussion of the Development stage, moving our concept medical device further along its journey to the Production stage.